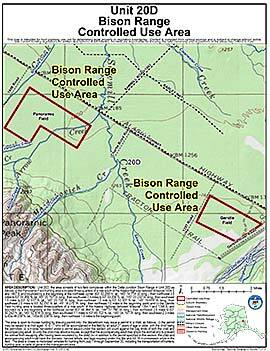 (ii) the Gerstle Field hunting area is located three-quarters of a mile south of the Alaska Highway between Milepost 1394.1 and 1396.8, and bounded by a line beginning at the northeast corner (63ø 48.984' N. lat., 144ø 57.766' W. long. ), then northwest 2.9 miles to 63ø 50.242' N. lat., 145ø 02.874' W. long., then southwest 1.1 miles to 63ø 49.102' N. lat., 145ø 04. 197' W. long., then southeast 2.3 miles to 63ø 48.239' N. 1at., 145ø 00.339' W. long., then northeast 1.6 miles to the beginning point.